More often than not, 'homologation specials' have gone into history as the finest road cars of their era. 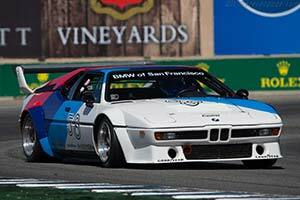 A great example is the BMW M1, introduced at the 1978 Paris Motorshow as the German company's latest GT racing weapon. Problem was that before the M1 could race in the intended Group 5 class, 400 road cars had to be built and sold. It would go a little far to describe these as street legal racing cars, but they offered supercar equaling performance. Today, thirty years after the M1 was first shown to the public, it is considered one of the most legendary BMWs ever built, but its conception, construction and racing career were far from trouble free. The M1 was very much the brainchild of BMW Motorsport's found Jochen Neerpasch. In 1976 he decided to start with a clean sheet for the replacement of the highly successful, but aging 3.0 CSL racing car. He had set its sights on the world manufacturer championship, which was held for the Group 5 class. The rules dictated a 400-car production minimum, but other than that were pretty liberal as to what modifications could be carried through. Taking full advantage of the clean sheet, Neerpasch laid out a mid-engined two-seater, to be powered by a 3-litre V10 engine. He expected the car to be highly competitive on the track and in addition help BMW to enter the elite group of supercar manufacturers. One of the first problems that Neerpasch had to tackle was BMW's inexperience with designing and building a mid-engined supercar. So he called in the help of the much more experienced Italians. Giorgietto Giugiaro's Italdesign was commissioned to design the exterior, while Lamborghini was given the responsibility to construct the car. Giugiaro masterfully combined elements from the Paul Bracq penned BMW Turbo Concept of 1972 with his familiar wedge shape design. The end result was a feast for the eys and even today looks remarkably modern, especially compared to other supercars of the day, like Lamborghini's Countach. The Italdesign labeled fiberglass body covered a state-of-the-art spaceframe chassis, constructed from square section tubes. The fully independent suspension and vented discs all followed the latest design trends. Unfortunately the V10 idea was binned as being too complicated and above all to expensive to design and develop in time. Instead the M1 was equipped with the familiar straight six out of the 3.0 CSL racing cars. Displacing just under 3.5 litres, it produced a hefty 277 bhp in road tune. Mated to a five speed gearbox, the 24-valve engine was mounted midships between the passenger compartment and the rear axle.